* A game for serious gamers. Gorgeous graphics using the latest high-end hardware. Broadband connections required for smooth play. We're making this game for those who want the best experience possible. * Make your own career. Your fortunes shift with the winds and your desires. Buy a naval commission and command a ship of the line. Turn traitor and work as a privateer for your former foes. Navigate the perils of war and weather as a merchant. You can do whatever your reputation allows - and your reputation is yours to create. * Epic adventure on a human scale. You'll be on a server with no more than a few thousand players. It's a world big enough for constant adventure, but small enough that your reputation carries weight with the people you meet. * Player-created content. We put the player community in the designer's seat. Using industry standard tools, you can create new textures and even 3-D models and submit them to the peer-reviewed web site for incorporation into the game. And you own what you create - if you design a new sword hilt or throne or sail design texture, you can make it freely available or charge for it within the game world. Earn in-game income from the sales of your designs! Or keep them to yourself and customize your own unique gear to the nth degree. * An ever-expanding game. Thanks to Valve's Steam technology, your computer will download new game content as it becomes available. Regular updates will roll out with new features, including avatar play, the magic system, and property development. The initial game of military action, trading fleets, and bloodthirsty piracy will evolve into a rich and player-directed world. Flying Lab Software disclosed the feature list for their Power & Prestige free expansion for Pirates of the Burning Sea. This is the first expansion for their swashbuckling game. 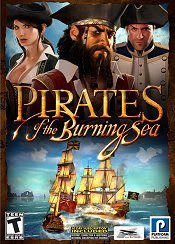 Flying Lab Software has an original offer to grab new players for Pirates of the Burning Sea: military personnel can play this MMORPG for free during 6 months. Flying Lab Software announced at PAX the first expansion for Pirates of the Burning Sea. Power and Prestige will arrive in Q2 of 2010 and it's a free expansion.